Sword Sets for sale are available in a variety of themes. Choices of sword sets include ninja, roman and samurai katana sets. Most ninja and roman sets feature a scabbard that can hold all of the swords. The samurai sword sets typically include a katana and two other Japanese swords along with a tabletop display stand. Buy all kinds of popular sword sets and displays on sale now. 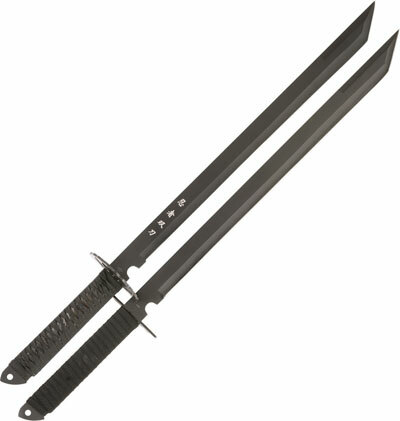 Dual Ninja Swords for sale feature two 28 inch swords. These Dual Ninja Swords each have half of a tsuba and appear to be a singular sword when the two swords are held together. The sharpened 10 ¾ inch steel blade has a black finish and features Japanese writing. They are full tang and feature a black cord wrapped handle. The black nylon scabbard hold both swords together and features shoulder straps. Buy the Dual Ninja Swords for $39.99.